Time is short these days, yes? But an investment of time (even a small investment), serves to build the community. When you arrive here, would you look over the faces of those who have already pulled up their chair? Would you ask God to point to a few people to go visit? Sometimes, He will lead you into those spaces because He has a gift for you there. And sometimes, He tugs at your heart because He has given you just the right words to pour into someone else's heart. Oh, and we cannot forget to thank Nancy for her ingenious tagline for this Soli Deo Gloria Sisterhood. I'm sure by now you are on pins and needles, waiting to find out just how you can get your very own Soli Deo Gloria shirt! A few notes first: Please know, if you are a past, present, or future participant of the SDG sisterhood, you can order this shirt! You can order one for you and one for a friend! We are an inclusive group of women and ALWAYS like to see new faces we can love and encourage. I am taking pre-orders this entire week (please help me spread the word so that people who might not see the blog this week can get in their pre-orders) so that I don't over order any size. All proceeds from the sales of the shirts will go to defraying the costs of the Soli Deo Gloria Retreat. Shirts range in size from small to 2XL and will all be "Carolina blue" in color, with white lettering. Each shirt costs $27 and this includes shipping (within contiguous 48 states). If you are ordering with an international address, please contact me so I can figure out your shipping). 1. In the comments section of this post OR in an email to me (jenfergie2000@me.com), please let me know which size shirt you would like. If you are leaving your order in a comment, please leave your email address as well as your shirt size because later, I will need to contact you to get your shipping address. 2. To pay for your shirt ($27, which INCLUDES shipping and handling), please use the Chip-In Widget in the right sidebar. This system uses PayPal, so it is a totally secure way to pay. Every time a payment is made, I get the name of the payor, so I will be able to see who has paid. 3. Pre-orders will close Sunday, March 11th (if there is enough interest, we can do another order later). 3. I am hoping to have shirts completed by March 21st and ready to ship out to you by the end of that week. 4. I know this might not be the most fluid way to do this, but thanks for bearing with me! So glad you liked the design....it is so much fun doing things like this! Love the design and color - will be ordering one soon! Love the tag line ... because it is so true. I am not a t.shirt girl, but this is really cute. Love the design and the tagline! The verse is perfect! I'll be ordering one. They are women's cut shirts, yes? Love the logo design for the shirt! Cool! Beautiful. 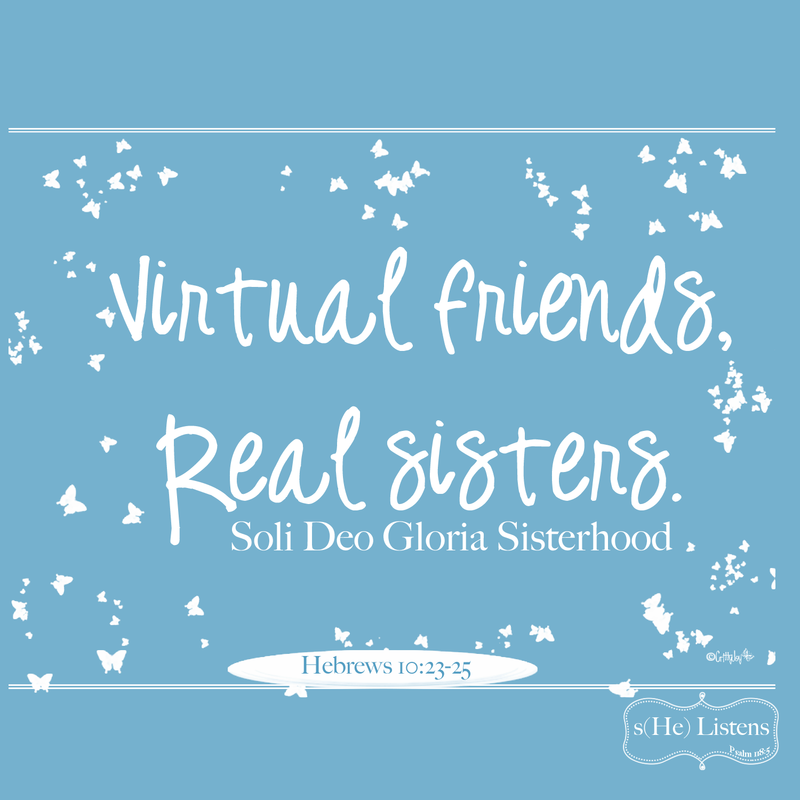 I've found so many real sisters in the virtual--and some have become real in the real. I struggle with feeling spiritually dry at times as well -- perhaps it's God's way of getting our attention, to slow down. Love the color.. one of my favorites. PLEASE, dear one, slow down and let Him fill you to Overflowing. That dry soul will see things in a new light once it's been watered a bit. You do such an amazing job taking care of others- now it's your turn! Praying for health in your family and spiritual replenishing for you. The chair thing is not a chat. However, it is still like a virtual sharing session. The point is to link up a post where you've shared your heart (something you might share at a bible study or MNO). Some of the other people that have linked up come an leave encouraging comments on your blog and you leave encouraging comments on other people's blogs that have linked up. The retreat is open to SDG peeps and my Bible study (or generally, St. Luke's women, if you would like to come). SDG people get to know each other by continually participating in the link-up and maybe even checking out other posts that they have written throughout the week. I'd love for you to become a part of SDG, Tammy! LMK if you have other questions. You can always send me a FB message. Much love!! Just wanted to drop you a note before I call it a day, Jen. I've been praying some sweet "soul rest" over you today. Not long ago I did a talk called "Hanging in the Hammock"- an invitation to Sabbath rest. Totally a new concept for me- but it's changing my life and my family's life, too. A few of the books that have really spoken to me on this sabbath journey have been- Mark Buchanan's "The Rest of God" (this one makes me WANT sabbath- amazing!) and Kerri Wyat Kent's "Rest"- it's one in a series - the whole series is great. Wishing you some sweet time in the hammock! I love the tagline: Virtual Friends, Real Sisters. The shirt is beautiful! 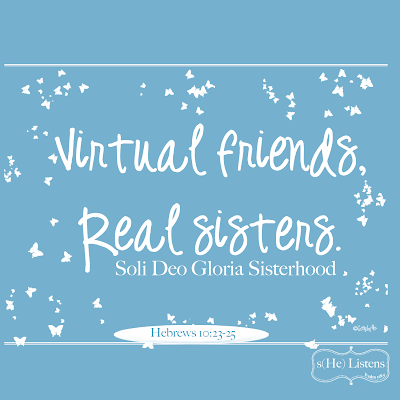 Love the color, love the font and especially love the "Virtual Friends, Real Sisters." I'm praying for the conference -- that it will be God-blessed beyond human hopes.